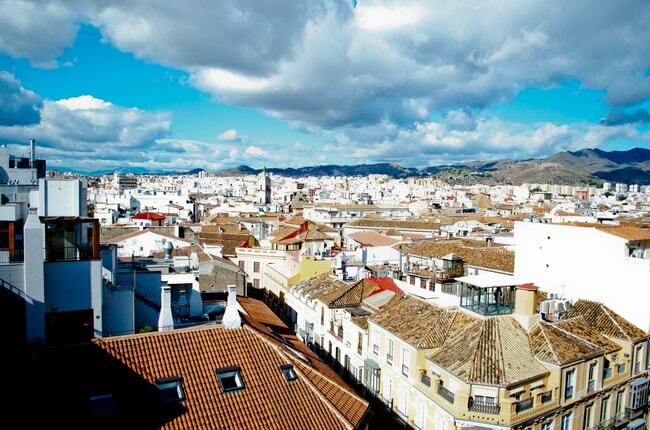 Visiting Málaga needn’t mean spending a fortune on hotels. This stylish, sophisticated city offers some fantastic budget accommodation in and around the historic city centre, giving you a reasonably priced base from which to explore its many attractions. 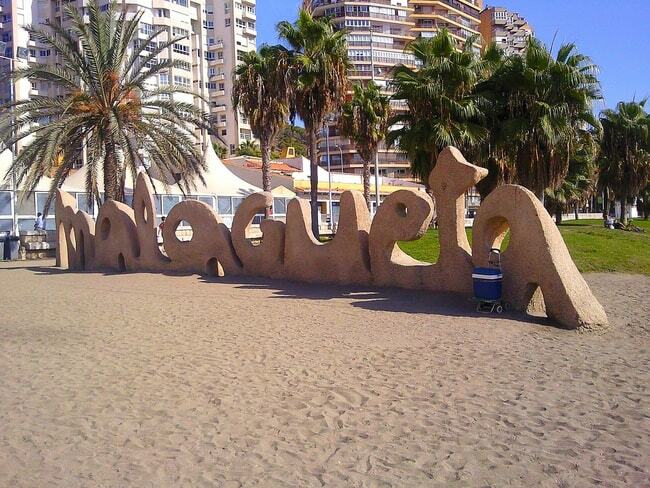 Read on for the top ten cheapest hotels and hostels in Málaga. 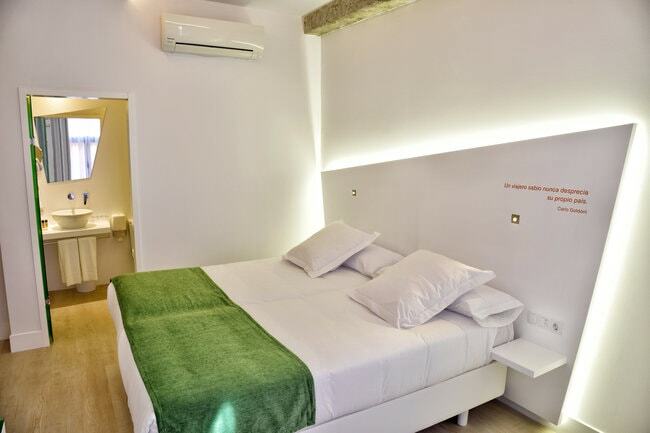 Located straight opposite the Moorish Alcazaba and less than a five minute walk from the Picasso Museum, the cathedral, the Roman theatre and El Pimpi’s restaurant, this modern hostel practically rubs shoulders with all of the city’s main attractions. The spotless doubles boast big, comfy beds and tall shuttered windows, some of which open onto the lively Calle Alcazabilla. Adding to the comfort levels are a super-cool cocktail bar on the roof terrace (from which the views of the Alcazaba at night are something else), a fourth floor restaurant and a well-equipped kitchen and chilling area on the first floor. A reception desk manned by charming staff ensures an exceptionally warm welcome, alongside excellent service in the bars and restaurant. This 68-room boutique is located right next door to the Mercado Atarazanas, one of Málaga’s oldest and grandest food markets (light sleepers might want to take a pair of earplugs for the early morning deliveries). Some of the minimalist, contemporary doubles offer views over the market itself, while others have balconies. There is a 24-hour self-service bar, a cafeteria, a ‘cybercorner’ and a ‘foragebrary’, where guests can select a holiday read from the mini-library. 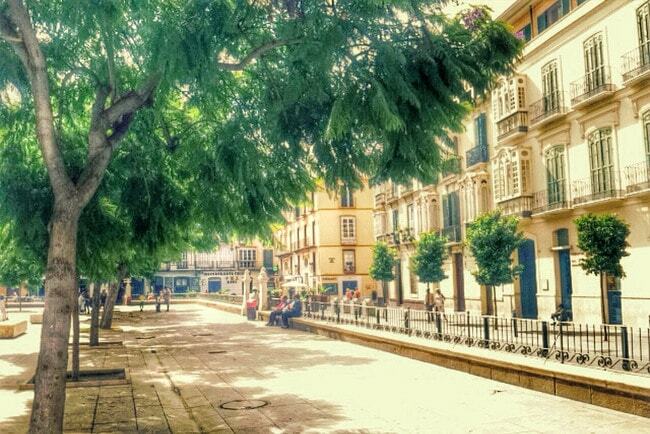 Calle Atarazanas runs parallel to Avenida Principal, one of Málaga’s major thoroughfares, which takes you to the beach in about fifteen minutes and the old town – via the smart, boutique-lined Calle Marques Larios – in ten. 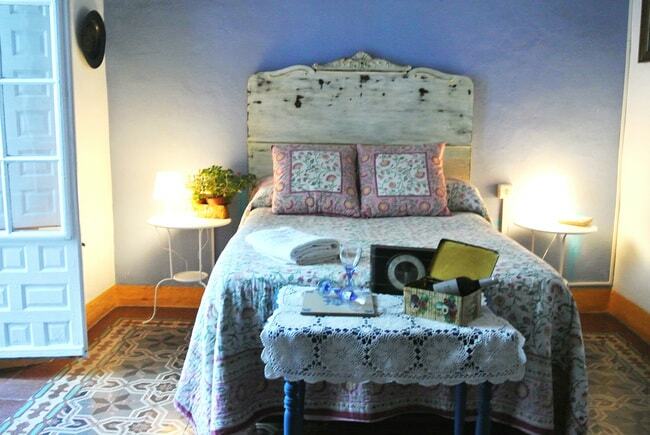 Located in the lively and hip neighbourhood of La Merced, about a five minute stroll from Picasso’s birthplace on Plaza de la Merced, Patio 19 offers some of the most characterful budget accommodation in Málaga. You’ll realise this is somewhere a little different even before you enter, as traditional flamenco dresses hang from some of the street-facing balconies, as if to dry. You’ll also find them draped across the double beds in some of the charmingly-decorated rooms, each one of which has been given its own character and style. An excellent, varied breakfast is included in the price of the room and one of Málaga’s coolest local bars, La Tranca, is about a two minute walk away. According to its funky website, Dulces Dream Hostel offers ‘the comfort of a hotel, the charm of a boutique and the price of a hostel’. That’s not an easy combination to pull off, but Dulces manages it with its charming rooms, each uniquely decorated with recycled materials and themed after a sweet snack. The ‘Basic’ rooms – Lemon Pie, Apple Pie and Blueberry pie – offer shared bathrooms (but there are two so it’s hardly sharing at all), while some of the en-suites have balconies overlooking the nearby Holy Martyrs church. The surrounding neighbourhood of La Merced is full of trendy bars and excellent restaurants, but if you’re feeling lazy there’s an in-house cafe with a lovely terrace on the square. Housed in a beautifully-restored 18th century townhouse, Casa de la Merced’s interior combines a classical Andalusian style with a modern touch. Each of its four uniquely-decorated doubles can be arranged into twin rooms if desired and all are kitted out with en-suites, mini-bars, remote-control air conditioning and satellite TV. 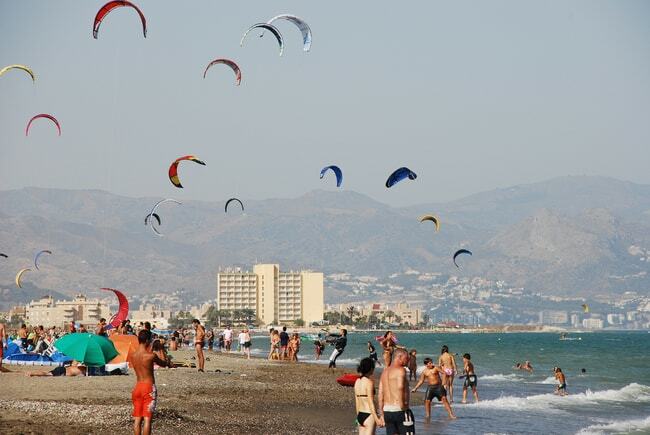 All of Málaga’s main attractions – including its enchanting old town – are no more than a ten minute walk away, while the Malagueta beach and the Muello Uno promenade are reachable in fifteen. Warm and friendly staff make staying at this lovely boutique a pleasure, too – they’ve even been known to prepare picnic breakfasts for guests with early starts. 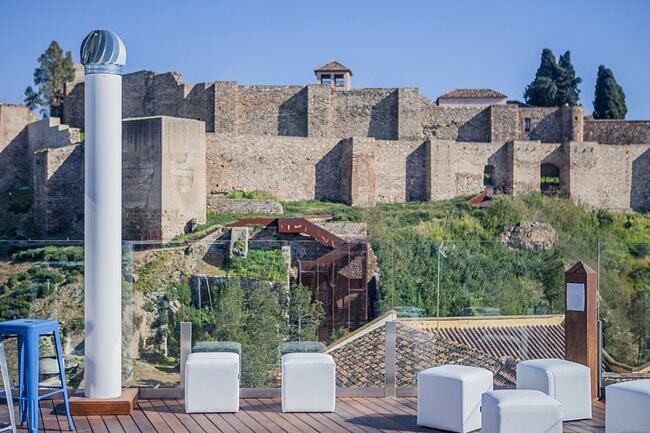 Hotel Málaga Picasso takes its name from the city’s most famous son and is located about six miles out of the historic city centre (take the number five bus if you’re heading in to see the sights), just a few minutes’ drive away from Málaga’s international airport. It’s the perfect place if you’re looking for country-hotel style accommodation that’s still close enough to the attractions of a major city. The surrounding neighbourhood is quiet, a beautiful open-air pool and jacuzzi are situated in lovely gardens and the Guadalmar beach is just 800 metres away. Four types of room are available – from economy to superior doubles with terraces – all of which are are spacious and light-filled and kitted out with air conditioning and a coffee machine. For traditional budget accommodation within flip-flopping distance of the beach, Hotel California is one of the best options in Málaga. Situated just a couple of hundred metres back from the Playa Malagueta – the city’s most popular beach – this family-run hotel offers comfortable and clean rooms, breakfast and friendly service. Even better, it’s only about a ten minute walk to the museums, galleries, cathedral and stunning Moorish Alcazaba fortress. Guests like the friendly, unpretentious style and the location and rate the hotel highly in terms of value. So you might say that you can check in any time you like – but that you probably won’t want to leave (come on, the Eagles song had to be mentioned at some point). 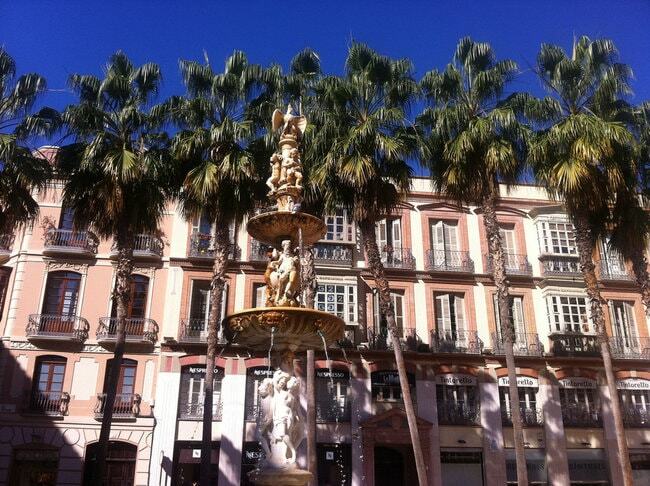 Venecia boasts one of the best locations in Málaga for a budget hotel: it’s situated at the port-end of one of the city’s main arteries, Alameda Principal, meaning that all the attractions and the old town are within a ten minute stroll. 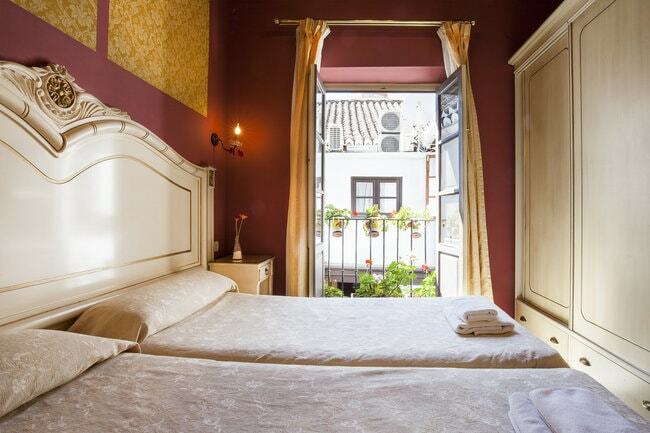 Its 47 rooms comprise singles, doubles and matrimonials at competitive prices and there is second and third floor accommodation intended specifically for guests who want a good spot from which to watch Málaga’s Semana Santa processions. Each of these rooms features two balconies that look out over the Alameda Principal – a fantastic view whether or not you stay during Easter. 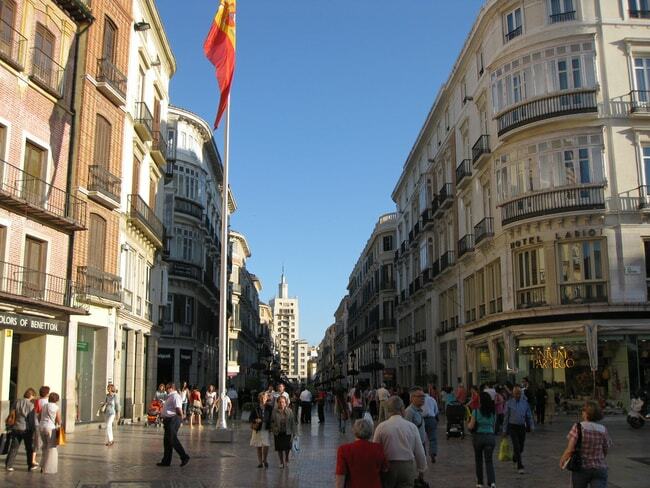 For shopping, the stylish boulevard of Calle Larios is just 50 metres away. As its name suggests, the 18-room Casa al Sur Terraza’s star feature is its cosy roof terrace, decorated with bold Mediterranean whites and blues and colourful potted plants. Breakfast is served here between March and November and it’s also a great place to enjoy an intimate, romantic cocktail before heading into the old town for dinner. Al Sur Terraza is situated in a largely residential neighbourhood the other side of the (mainly dry) Guadalmedina river from Málaga’s principal attractions and historic quarter – but don’t worry: all the action is less than a fifteen minute walk away. There’s a comfortable lounge equipped with books and games and a communal kitchen for guests bringing their own supplies. If you’re visiting Málaga and are looking for budget accommodation a little out of the busy city centre, Casa Vazquez takes some beating. Located in a peaceful neighbourhood about a mile north of the city’s old town and attractions, it offers nine en-suite doubles, some of which have balconies offering fabulous views out over the rooftops of Málaga. The centre is about a 20 minute walk away, but if you fancy staying in of an evening, Vazquez has a highly-rated restaurant that specialises in Malagueño dishes. The beef stewed in sweet wines from the nearby mountains and the pork cheek cooked in honey are wonderful, and from Monday to Friday a €7 per-person set menu offers excellent value.